~Anna Quindlen, “Enough Bookshelves,” New York Times, 7 August 1991. 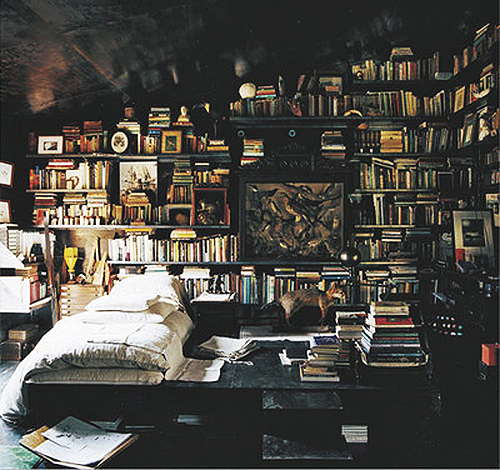 This room is in Mildred’s Lane, the Pennsylvania artist’s colony that J.
Paul Smith is not only the classic English mischievous rogue type, and a self-effacing dandy, but he also reads. I wish he would drop by our studio. 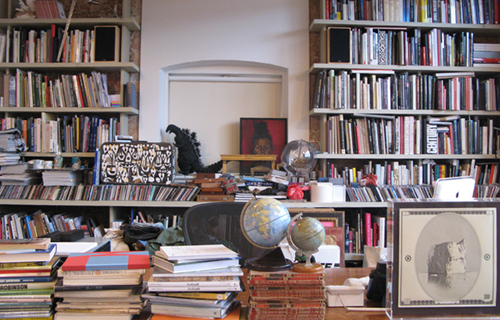 The photo of his cluttered office is from Vancouver magazine The Block. There’s a funny story there about an anonymous fan who’s been sending him objects in the mail, with Smith’s address and the correct number of postage stamps just stuck to the surface of the object itself.